Under Virat Kohli's captaincy, India have now registered nine consecutive Test series win. Indian skipper Virat Kohli has been phenomenal with his bat and his captaincy in the year of 2017, amassing 2818 international runs across all formats. He scored 1059 runs in 10 Tests, 1460 runs in 26 ODIs and 299 runs in 10 Twenty20 Internationals including 11 hundreds (three double centuries). The 29-year-old dashing right-hander broke many records with his stunning form with the bat, in the recently concluded three-match Test series against Sri Lanka, smashing 610 runs with an amazing average of 152.50. With India’s draw in the Delhi Test, the hosts registered a 1-0 victory over Sri Lanka, and it was 9th consecutive Test series under Kohli. With the series win, Virat Kohli added another feather to his cap, equalling former Australia captain Ricky Ponting's record of nine consecutive series victories as captain. The three-time World Cup winning Australian captain Ponting led his side to nine straight series victory from 2005 to 2008. Apart from India and Australia, England (under multiple captains) is also another country who have enjoyed nine straight series triumphs from 1884 to 1892 in the Test cricket. 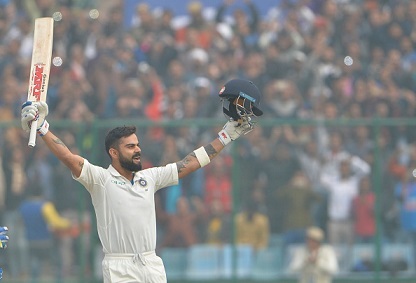 Although, Virat Kohli will remain third on the list of most number of runs in a calendar year, as Sri Lankan legend Kumar Sangakkara is No.1 with 2868 runs (2014), while Ponting is second with 2833 runs in 2005. He also becomes the first Indian to score 600-plus runs in three different series, smashing 692 runs vs Australia in 2014-15 (away), 655 runs against England in 2016-17 (home) and 610 runs in the just concluded series against Lanka. Before Kohli, Sunil Gavaskar and Rahul Dravid had achieved the feat to score 600-plus runs in three different series twice in their cricketing career. If Kohli lead Team India clinches the upcoming Test series against Africa, then the dashing right-hander will overtake Ponting’s record and become the captain with most consecutive triumphs in Test series.